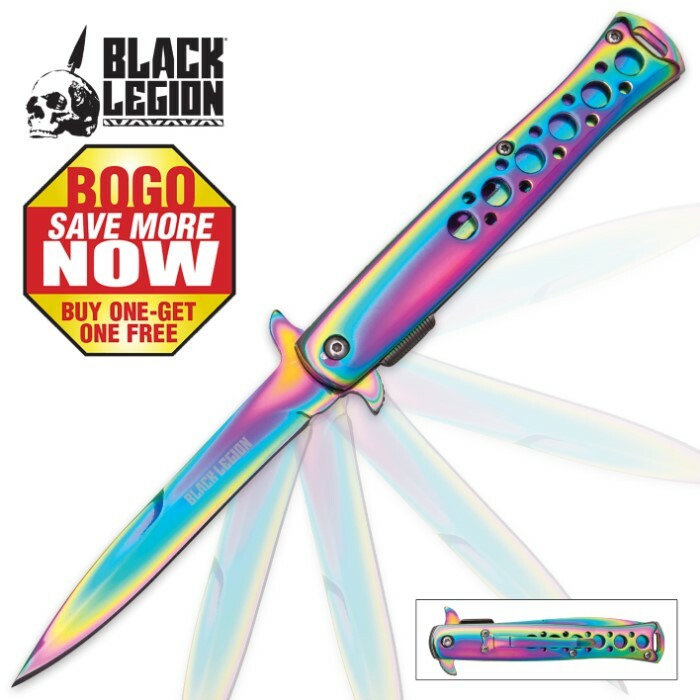 This is an amazing looking stiletto blade to take out and show your friends. The rainbow titanium finish on both the blade and handle puts it in a class all its own. With a nudge of the handy flipper, the 4" titanium coated stainless steel blade flies open with impressive speed, thanks to the advanced assisted opening mechanism. At 5" closed, it's easy to carry anywhere, especially with the integrated pocket clip. Truly a one-of-a-kind beauty and now, you get two of these for the price of one! How i love the sturdyness of the knife and how pretty it is but my main problem with this is opening it, it is way to hard to open. This knife looks good,the mechanism works smoothly,and the price is right.